When the Winston Cup crews arrived at Daytona for the kick off event of the 1994 season, one of the track's favorite sons had been lost. Davey Allison, who had been part of those memorable finishes of 1988 and 1992, had lost his life in a helicopter accident the previous summer. Ernie Irvan had signed on to drive the Havoline Ford, Davey made famous, leaving the Morgan-McClure team that had helped him claim the 1991 Daytona 500. Editor’s Note: The following is part 10 of Matt McLaughlin’s 11-part series on the history of racing at Daytona. Miss the first nine editions? Don’t worry, we have the links for you here. Enjoy! When the Winston Cup crews arrived at Daytona for the kickoff event of the 1994 season, one of the track’s favorite sons had been lost. Davey Allison, who had been part of those memorable finishes of 1988 and 1992, lost his life in a helicopter accident the previous summer. With Allison leaving a huge void to fill at Robert Yates Racing, Ernie Irvan had signed on to drive the Havoline Ford Davey made famous, leaving the Morgan-McClure team that had helped him claim the 1991 Daytona 500. The split had not been an amicable one, and there were hard feelings on both sides; Sterling Marlin was eventually tabbed to inherit the ride in the Kodak Chevy. Perhaps fittingly that year’s Daytona 500 would come down to a contest between those two drivers and teams. Early in Speedweeks, it seemed the story to watch was going to be the return of Hoosiers to the sport and the resumption of the tire war. Only a few teams had signed on to run Hoosiers, most notably Darrell Waltrip and Geoff Bodine, but it was Loy Allen in a Hoosier-shod Ford that stunned everyone by taking the pole position for the race. The expected confrontation between the tire companies never took place; in a terrible tragedy leading up to the race, Neil Bonnett was killed in practice, and while it was not immediately known if it was a tire failure that caused the fatal wreck, Bob Newton, president of Hoosier, announced for safety’s sake, they were withdrawing their tires from that event. (It later turned out it was a cut tire, not tire failure that led to the tragedy). During the race itself, Ernie Irvan seemed to have the car to beat that day, with plenty of Robert Yates horsepower under the hood. But Sterling also had a strong car, and he assumed the lead late in the going. Irvan managed to regain the advantage, but unfortunately, his last set of tires were not to his liking, and Marlin took the lead for good with 21 laps remaining. For a time, it seemed the two Fords of Irvan and Mark Martin would draft together to get by Marlin, but Mark ran out of gas for the second time in as many races at Daytona, and Irvan ran out of drafting help. So, Sterling Marlin won his first race in 278 starts that day at the same track where his father, Coo Coo Marlin, stunned everyone by winning a 125-mile qualifying race as an underdog independent, proving the nut does not fall far from the tree. Tires once again were a major story at the Daytona 500 of 1995, but the problem was a perceived shortage of Goodyears that led to dire predictions that by the end of the race there would be no tires left for the final pit stops. NASCAR tried to intervene to distribute the tires to all the front runners as other competitors fell out, leading to the memorable scene of Dave Marcis sitting atop his tires refusing to give them up, having promised them to his friends on Dale Earnhardt’s team. Sterling Marlin was back, and though he had not won a race since the ’94 500 he was considered an early favorite. But Sterling was living in the shadows of the week’s big winner Dale Earnhardt, with everyone saying it was finally going to be Dale’s day to win. Earnhardt had already won his qualifying race, the Busch Clash, and the IROC race…there was just one trophy left to collect, and Dale was on a roll. For numerologists, it was also Dale’s 17th attempt at the 500, the exact amount of tries it had taken another star-crossed Daytona 500 veteran, Darrell Waltrip, to win his first race. While Earnhardt may have had the prerace attention, it was Sterling Marlin who emerged from his shadows to dominate the race, leading over half the laps. Running on worn rubber in fifth place, Earnhardt knew he had nothing to offer Marlin, so his team gambled and pitted for fresh rubber during a late caution period while most of the lead lap cars stayed out. Earnhardt restarted in 14th, but quickly began charging through the field. In the end, his gallant effort came up one position short, and once again, Dale was “first loser” in the Daytona 500, this time to Marlin. ” This is the Daytona 500, and I don’t reckon I’m supposed to win the damn thing.” a frustrated Earnhardt told the TV crews. Meanwhile Marlin was celebrating in Victory Lane, adding his name to a short list of back-to-back Daytona 500 winners: Richard Petty and Cale Yarborough. That’s pretty good company to keep. Sterling was back for the 1996 Daytona 500 and followed all his normal prerace rituals, including the fried bologna sandwich for breakfast, in an attempt to be the first driver ever to win three consecutive Daytona 500s. Unfortunately, he fried an engine in the race itself, and wound up 40th. Once again, Earnhardt looked like the man to beat. He won the pole for the race, the IROC race, and his seventh straight 125-miler qualifier race. It seemed Lady Luck only took a dislike to Dale for the 500 itself, but he seemed clearly established to break the curse heading into Sunday. Meanwhile, Dale Jarrett was back with Robert Yates driving a second car, a move that surprised many people as Jarrett had only won one race with the No. 28 bunch the year before while subbing for an injured Ernie Irvan. He was out to prove Yate’s confidence in him was well-founded; as it turned out, it was. In the closing laps of the race, it came down to the Dale and Dale show, just as it had in 1993. Ken Schrader and Mark Martin were the jokers in the pack; with the draft as important as it is at Daytona, whichever Dale they chose to partner with would have a clear advantage. Mark was in a Ford and Schrader in a Chevy, so it seemed obvious which of the twosome they each would choose. It didn’t happen like that. Earnhardt ducked low on Jarrett several times, but Schrader would not join him, as Kenny was trying to hook up with Mark to get around Earnhardt and perhaps take a shot at Jarrett. So, just as they had in 1993, Jarrett and Earnhardt raced hard to the checkered flag, but once again Jarrett took the victory, and a clearly annoyed Earnhardt had to settle for yet another second place, all the while crossing Ken Schrader off his Christmas card list for the foreseeable future. The 1997 Daytona 500 was another race Earnhardt seemed to have a great chance of winning, as he battled with his old nemesis Bill Elliott late in the going. While the early stages of the race were run without any of those fearsome chain reaction wrecks that often mar restrictor plate races, in the end it was a crash that decided it. Jeff Gordon seemed out of contention after having to pit for an equalized tire that almost had him a lap down and running by himself while the lead draft closed in. A timely caution though, let Jeff stay on the lead lap, and he quickly worked his way back to the front. Long time fans of the sport were thrilled to see two favorites, Bill Elliott and Dale Earnhardt, leading the pack, seemingly trying to open a little distance so they could decide the race amongst themselves. Behind them, the two Robert Yates cars, Ernie Irvan and Dale Jarrett, were working together to close in on Jeff Gordon, who was positioned third. But behind the Yates cars, streaming to the aid of their Hendrick teammate, Gordon, were Terry Labonte and Ricky Craven. It looked to be a strategist’s race at that point…but the complexion of the race changed in the blink of an eye. Earnhardt skated up the track a little coming off turn two, and Gordon dove low for the pass. Earnhardt brushed the wall, came back, and tagged Gordon. While Gordon was able to drive on, Ernie Irvan got into the back of Earnhardt, setting off a wreck that saw Eanrhardt’s car roll violently, also collecting Jarrett in the process. While in the ambulance Earnhardt noted, somewhat surprised, his thoroughly battered race car still had four wheels under it, heading in approximately the right direction. He climbed out of the ambulance and asked the tow truck operator to try starting the car. When the engine thundered to life, Dale hopped back in his car and drove it back to the pits, where after some brutal sheetmetal surgery, a bunch of bungee cords, and a mile of duct tape were employed, the team got the car patched up enough to finish the race, to the thunderous applause of the crowd. That left Gordon, Labonte, and Craven to battle Elliott’s Ford for the win. Imagine poor Bill Elliott, looking in the rearview mirror heading to the restart and not only seeing three bow ties and no blue ovals, but three teammates to boot, carefully coordinating their strategy via two-way radio. Shortly after racing resumed, Gordon dove low to try to get around Elliott. Elliott moved low to block him, but Jeff moved still lower. Longtime fans were expecting a replay of Donnie Allison and Cale Yarborough’s wreck at the ’79 500, but Bill moved up just enough to allow Gordon enough room for the pass rather than having them both wrecked out of the event. That minor lift out of the throttle allowed the other two Hendrick cars to pass Elliott, too. Whether Bill could have battled back to win quickly became a mute point; a violent 11-car wreck caused the race to end under caution. 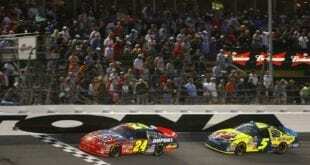 The three Hendrick teammates, Gordon, Labonte and Craven, finished 1-2-3, in that order, a Daytona 500 first. Gordon also became the third different Team Hendrick driver to win the Daytona 500, a feat only the Wood Brothers and Petty Engineering had managed previously. 1998 marked NASCAR’s big 50th Anniversary Celebration, and the sanctioning body couldn’t have scripted a better way to kick off the season. Buddy Baker had broken his Daytona 500 curse in 1980. Darrell Waltrip had finally managed to win the Daytona 500 in 1989, nine years later. Another nine years had passed, and it seemed time that Dale Earnhardt would finally beat the bad luck that had plagued him in the biggest race of the year. Earnhardt did nothing to dispel the notion, winning his ninth straight 125-mile qualifying race. As the race began, Earnhardt was strong but not overpowering; however, on lap 140, he regained the lead from his teammate Mike Skinner, putting himself in control of his own destiny. A late caution (only the second of the event) allowed everyone to pit for fresh rubber and enough gas to get to the end with 30 laps remaining. At that point, Earnhardt still had the lead, but teammates Jeremy Mayfield and Rusty Wallace, as well as Bobby Labonte, were set to give him a hard run to the checkers. The drama ended one lap prematurely, when on lap 198, Jimmy Spencer got into John Andretti, triggering a wreck. Realizing that the race would end under caution, the five lead cars waged an epic scrap on lap 199, with both Labonte and Mayfield coming hard after the No. 3 car. Coming onto the frontstretch, Rick Mast’s slower car blocked the low lane. Earnhardt used that car as a pick, and Mayfield and Labonte touched several times trying to get around Mast, losing their momentum. Having made the right move, Earnhardt took the white and yellow flags that guaranteed him a victory. As a salute to one of the most accomplished NASCAR drivers ever, every member of every team came out across pit wall and lined up to congratulate Earnhardt as he came slowly down pit road, with The Intimidator’s hand out the window exchanging high fives with the other members of the NASCAR family. To cap off the celebration, an emotional Earnhardt took to the trioval grass (after radioing NASCAR for permission) and wrote a big number “3” with his spinning rear tires in the turf. The 1999 Daytona 500 was a wild affair that seemed a wide open battle among all the sport’s top drivers. The complexion of the race changed completely on 135 when contact between teammates Kenny Irwin and Dale Jarrett set off “The Big One,” a 13-car pig pile of a wreck that eliminated Jarrett, Mark Martin, Jeff Burton, Steve Park and others. Dale Earnhardt and Jeff Gordon hooked up late in the race to drive to the front; Rusty Wallace, who led the most laps in the race, had the lead, but the rainbow colored and black cars were stalking him relentlessly, as both had fresher tires than Wallace. On lap 190, Gordon made a “no guts, no glory” move to get around Wallace. Jeff dove low, and Rusty moved down the track to block the move. Gordon continued onto the apron of the track, and the two cars were running side-by-side. Up ahead lay the crash damaged and slow moving car of Ricky Rudd, also on the apron of the race track. It was a high speed/high stakes game of chicken, and finally, Rusty got out of the throttle and moved to his right to allow Gordon room to get back on the track. His momentum broken, Wallace not only lost the lead, but fell back to eighth place in the final rundown. For the final ten laps, Earnhardt and Gordon went at it Hell’s Bells, and even coming out of turn four to the checkers it was not clear who had the advantage. In the end, Gordon prevailed by 0.128 seconds in a race that lasted over three hours. There haven’t been many Daytona 500s as dull as the 2000 event. From the very start of Speedweeks, it was clear Dale Jarrett had the dominant car. He took the pole, and he won the Bud Shootout. The only real drama in 2000 came after a Happy Hour wreck significantly damaged the No. 88 car. Unwilling to relinquish DJ’s pole position, Robert Yates called the fabricators back at the shop outside of Charlotte and told them to get to Daytona Beach right away. When they arrived, Todd Parrott briefed them on the damage he’d found on the car before the garage area closed for the evening. At 4:45 that morning, the No. 88 team began rebuilding the extensively damaged car. When the race started, DJ felt out the car for a few laps, announced it was race ready and went directly to the front. A small group of drivers latched onto the fleet Ford and formed a five-car breakaway that drove effortlessly away from the field. 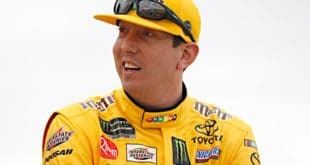 During the final round of scheduled pit stops, frustrated crew chiefs kept trying to come up with a magic formula that would allow them to beat the clearly dominant No. 88 car. Some tried two tire stops, including Johnny Benson’s Tim Beverly owned team that had arrived at Daytona without a sponsor. The gambit nearly paid off and allowed Benson to pull the upset, but a six car wreck triggered a lap 194 caution and allowed Jarrett to restart on the tail of Benson’s car. DJ simply pushed the No. 10 car aside, went into the lead, and took off to take the checkers. Benson fell to 12th in the final rundown, while Jarrett won his third Daytona 500. Next Where Are All The Purists Now?